Azor Ambiental has become one of the few Spanish firms in the recycling and smelting sector to receive the OHSAS 18001 Certification, a prestigious international distinction for companies with a solid, effective occupational health and safety management system. This certification confirms the use of a proper procedure for reducing health- and safety-related risks in the work environment, hence benefiting employees, clients and the public in general. Implementation of this procedure contributes to enhancing the working environment, reducing work accidents and decreasing occupational illnesses. The OHSAS 18001 standard is a tool that will allow the company to establish a management system complying with current regulations, as well as to thoroughly monitor risks related to its business activity and implement the occupational health and safety measures needed to have a safe and healthy working environment. 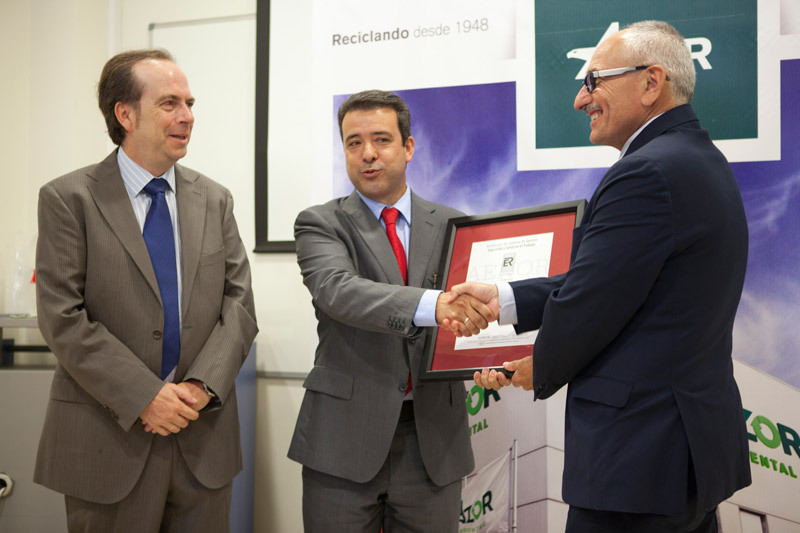 The OHSAS 18001 certification was officially handed over on Tuesday at the premises of Azor Ambiental in the town of Molina de Segura. Ángel Luis Sánchez Cerón, head of Aenor's office in the Region of Murcia, awarded the certification to Andrés Gil Buendía, president of Azor Ambiental. Tomás Pérez Fuentes, director of the Region's Occupational Health and Safety Institute, was also present at the short ceremony.